“Catholic and Southern, Wife and Mother.” That’s how I described myself for my original About page on this blog as well as on Twitter. What I put first says everything about who I think I am and what is important to me. Being Catholic is at the core of everything else about me. I’m a cradle Catholic, and so was my mother, and my grandmother, and her father . . . But especially since I’ve started doing genealogical research, I’ve learned that Catholicism has come down to me along a very slender thread. Raised to think of myself as half Irish and half Scots, I have learned that I’m just as much German and English. And my forebears were mostly Protestant. My father’s side of the family is Protestant. My mother’s father’s side is Protestant. Her mother’s mother’s side is Protestant (although Grandmother did convert). It was her mother’s mother’s father’s parents, Hugh Higgins and Mary Foley Higgins, born in Ireland in the 1830s, who were the original Catholics in our family. And you know, don’t you, who brought the faith to the Irish? I’ve dressed in green, and worn “Kiss me, I’m Irish,” pins, and sung hymns to St. Patrick every year since I was a child without ever thinking of how much I owe him. And as my husband pointed out last night when I shared this revelation with him, St. Patrick’s influence continues through the generations, since John would never have become Catholic if he had not married me. I’ve linked this up with #WorthRevisit, a weekly recycling of great posts hosted by Reconciled to You and Theology Is a Verb. I encourage you to click the picture to read more! My father’s relatives used to believe we were all going to hell because we were sprinkled instead of immersed. I hope they’ve mellowed out a bit. 🙂 His part of the family didn’t practice any religion when he was growing up. He was baptized as an adult and is a Lutheran now. I am a cradle Catholic and 75% Irish I’ve been told. I’ve never studied my genealogy but now you have me wondering….I’ll play it safe and just be grateful to St. Patrick. Have you ever prayed St. Patrick’s Breastplate prayer? A priest gave it to me in confession once and recommended I pray it every day so I do. He gave me the full version which is hard to find. Most sites have an shortened version because the original is so long. You can find the whole version on a bookmark at catholicholycards.org Anyway the prayer has grown on me it is really quite beautiful! Oh, yes, I LOVE that prayer! I don’t know whether the version I have heard is shortened or not so I will have to check that out. Thanks! It’s always interesting when you look back into your family history! You never know what kind of surprises you might find! My husband loves genealogy, he does projects with his students on it every year! So true! That’s great that he is introducing his students to it. They will thank him later. 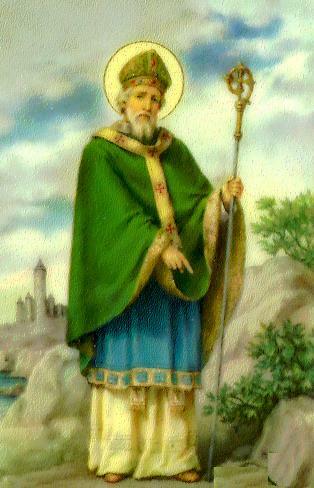 An interesting post regarding the origin of St. Patrick’s Day and as always, a fun read. What a refreshing way to REALLY celebrate St. Patrick’s Day, in honor of someone who spread the gift of the gospel! Family history is so interesting to me. You never know what you will find when you start digging. You found something very special! I love this story, Leslie! Happy St. Patrick’s Day! I read about Catholicism in Ireland and it was very interesting! It was also fascinating to know that the Pope said it is the most Catholic country in the world!